When making an inspection on an electric sign or field-installed skeleton tubing installation, where does one begin? Well, there are undoubtedly several answers to that question from the many inspection jurisdictions charged with the task of adopting and enforcing the requirements of the electrical Code. Experience has indicated that there are a wide variety of approaches to conformance assessment of these electrical signs and displays, or other types of outline lighting, falling under the scope of the adopted Code. It is best to get right to the point and not water this down too much, because this needs to be said. Basically there are inspection jurisdictions that are doing the job, there are those doing part of the job, and there are those not doing the job at all. From the enforcement perspective, this lack of consistent and uniform enforcement of the minimum Code rules for electrical signs and outline lighting installations has lead to installations that are often less than code-compliant to put it mildly. This article will serve as a small reminder of the role we share in achieving electrical safety in these types of installations. If you are involved in electrical inspection, you might decide to critique your approach to inspections of electrical sign displays or field-installed skeleton tubing installations, or how your jurisdiction requires these types of electrical safety inspections to be handled. Although administrative and procedural policies will vary from one jurisdiction to another, our goal for the technical enforcement of these installations should be very consistent and uniform. This will possibly be like breaking new ground and involve change, which society is more often than not naturally resistant to. More than likely, there are many challenges and much work to be done in this area. The amount will vary from one area to another and often involves becoming more knowledgeable by acquiring additional training, in many cases for inspectors as well as installers. It also requires developing and maintaining open and effective working relationships with the electrical sign industry. IAEI is an organization with a primary concern for electrical safety. The association is also interested in consistent and uniform enforcement of the applicable electrical codes and standards. Establishing good solid working relationships is an important part of helping in this area. It can be said, without a doubt, that installing contractors, owners, and inspectors all desire the electrical installations to be safe. Meeting the minimum requirements of the applicable electrical and building codes is an essential element, and in those areas or regions that adopt the National Electrical Code into law, it is required. Let’s take a look at some of the basic requirements contained in Article 600 of the NEC that can assist enforcement officials in carrying out their responsibilities in attaining code-compliance in these areas. The first section of Article 600 provides the scope of coverage. Clearly within the scope one can identify the type of electrical signs and outline lighting installations that the rules in the article apply to. The article contains rules for installations of conductors and equipment for all electrical signs and outline lighting installations. 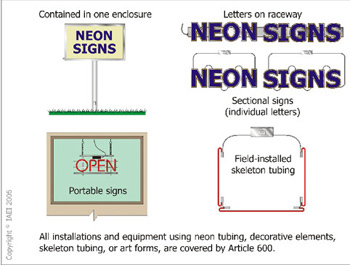 Those installations that include the use of neon tubing—such as signs, decorative elements, art forms, or skeleton tubing—are covered by rules in Article 600 (see figure 1 and photos 1 and 2). So, basically, all electrical signs, displays, and most outline lighting installations are covered by the rules in Article 600. 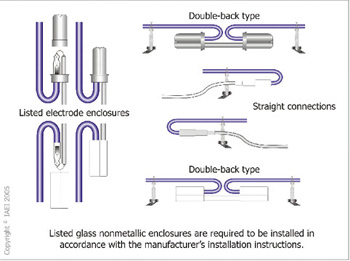 It should be emphasized that there are outline lighting installations that can be installed using luminaires (lighting fixtures) that are wired in accordance with the rules in chapter 3, as well as other applicable requirements in chapters 1 through 4, such as grounding and bonding in chapter 2, connections and mounting of equipment in chapter 1, and the rules for luminaires (fixtures) found in chapter 4. When applying the requirements of the Code, it is often helpful to develop an understanding of defined terms to assist with correct application of the rules to electrical installations and systems. It is no different when it comes to electric signs and neon installations. There are many essential definitions contained in Article 100 that apply to sign installations such as wet locations, dry locations, listed, labeled, and several others. There are a few specific and key definitions provided in Section 600.2 that provide additional information to assist in proper application of the rules. Electric-Discharge Lighting.Systems of illumination utilizing fluorescent lamps, high-intensity discharge (HID) lamps, or neon tubing. 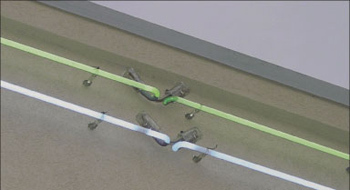 Neon Tubing.Electric-discharge tubing manufactured into shapes that form letters, parts of letters, skeleton tubing, outline lighting, other decorative elements, or art forms, and filled with various inert gases. 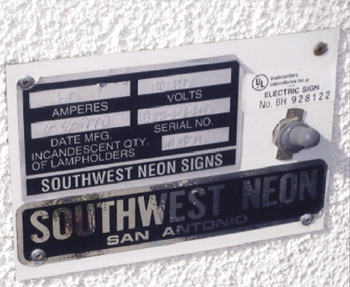 Section Sign.A sign or outline lighting system, shipped as subassemblies, that requires field-installed wiring between the subassemblies to complete the overall sign. 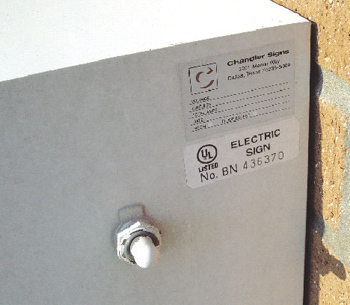 Sign Body.A portion of a sign that may provide protection from the weather but is not an electrical enclosure. Skeleton Tubing.Neon tubing that is itself the sign or outline lighting and not attached to an enclosure or sign body [NFPA 70 600.2]. 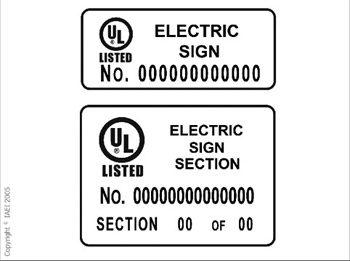 The definition of section sign is included in Section 600.2 to provide a description of one particular type of listed electric sign discussed in Section 600.12. Signs are usually required to be listed as indicated in 600.3 and can be manufactured in various forms. 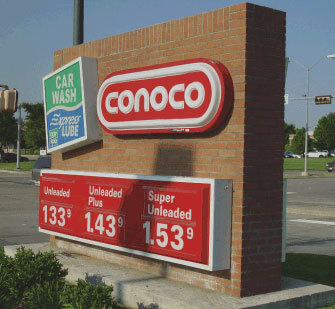 Three of the most common forms include an all-in-one electric sign with one listing mark, listed section sign delivered to the site in sections (subassemblies) and assembled on-site (including connections and field wiring between sections) and then installed as a complete sign. Another very popular listed section sign is shipped to the site in sections or subassemblies and installed, but the sections are remote from one another. This type of section sign requires field-installed wiring between the sections and the associated power supplies or transformers (see figure 2 and photo 3). It is important to note that even though each section of the overall section sign is listed, the field-installed secondary wiring must be verified by the AHJ for compliance with any installation instructions and applicable provisions of Article 600 that could, and often does, include some of Part II of Article 600. Field-installed secondary wiring includes the wiring method used, the type of fittings for the particular wiring method, and grounding and bonding provisions. All of these field-installed materials associated with listed sections signs must be verified for compliance with the required manufacturer’s installation instructions as well as applicable Code requirements. The definition of section sign should assist installers and the enforcement community by providing clarification as to the rules that apply to these listed signs that are beyond the scope of the product standard UL 48 Standard for Electric Signs. section signs, and outline lighting to be listed and installed in conformance with that listing, unless otherwise approved by special permission. This specific listing requirement makes the task of attaining code-compliance in these installations much easier. By requiring electric signs and outline lighting to conform to this listing requirement, the installations will be more uniform and should more consistently qualify for approval. The term special permission is defined in Article 100 as “the written consent of the authority having jurisdiction.” Special permission is sometimes necessary and utilized in the approval process for installations covered within the scope of Article 600 but is unique in nature, or, perhaps, includes unique characteristics or features for which Code rules have not yet been developed. Field-installed skeleton tubing installations, on the other hand, are not required to be listed, but they are required to meet the requirements of the Code. Part II of Article 600 provides many special requirements for these types of installations. It should be noted that outline lighting can consist of listed luminaires (lighting fixtures) that are wired in accordance with chapter 3 of the Code. Special permission is often issued by the building safety departments in the form of a modification or variance, but always must be in writing. Generally, the details and specific criteria of how the unique installation meets the equivalent and effective safety desired for the particular situation are provided as part of this documented and written special permission. The method used in granting special permission can vary from jurisdiction to jurisdiction. Each will have particular policies or procedures for granting approval by special permission. As provided in Section 110.3(B), “listed or labeled equipment shall be installed and used in accordance with any instructions included in the listing or labeling.” Listed and labeled equipment usually includes installation instructions either labeled on the equipment or separately. Inspectors enforcing this requirement are well on their way to attaining code-compliance and being able to issue confident approvals of these types of installations. Most listed signs including listed section signs are required to include installing instructions in accordance with the product standard. Inspectors should be requiring these installation instructions and using them in the inspection process. Installers should also be using them to complete the installation. This has a built-in feature of bringing both the installer and inspector to the same page, so to speak. The field-installed wiring associated with listed section signs must also meet any other applicable requirements of the Code. Figure 4. Glass electrode enclosures (glass cups) are suitable for indoor and outdoor locations. skeleton tubing installations, the general concept of requiring listed products and components to be installed is of great assistance to installers and goes a long way in getting the green tag approval from the approving authority. The only other challenge, once listed products and components are used, is to be sure that they are used within the limits of how they were evaluated and intended to be used. 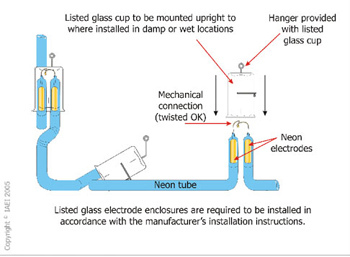 For example, an electrode enclosure (boot or glass cup) that is listed for dry or damp locations would be unacceptable if used inappropriately in a wet location and, certainly in most cases, welcomes unwanted failure (see figures 4 and 5). Failures in high voltage secondary circuits can and do cause fires. This is another real important reason to use the proper products for the job, and ensure that the minimum requirements of the Code are met. Electricity is a powerful force and can cause serious and costly damage if not handled properly. Signs and outline lighting systems incorporating in-candescent lampholders are required be marked with the maximum allowable wattage of the lamps, and these markings shall be permanently installed, in letters at least 6 mm (¼ in.) high, and must be located where visible during the relamping process [see NEC 600.4(A) and (B) and figure 6 and photo 5]. Each commercial building and commercial occupancy accessible to pedestrians is required to be provided with a minimum of one outlet for sign or outline lighting system use. This is not a receptacle that is required but an outlet (see the definition of outlet in Article 100). This outlet must be located in an accessible location at each entrance to each tenant space. It should be noted that the Code does not recognize service hallways or corridors as accessible to pedestrians for the purpose of proper application of this section. The required outlet(s) shall be supplied by a minimum of one branch circuit rated at not less than 20 amperes. This branch circuit is not permitted to supply any other load(s). 1. Branch circuits that supply signs and outline lighting systems containing incandescent and fluorescent forms of illumination shall be rated not to exceed 20 amperes. 2. Branch circuits that supply neon-tubing installations shall not be rated in excess of 30 amperes. The wiring methods used for the branch circuit(s) supplying electric signs and outline lighting systems must meet the applicable requirements of Sections 600.5(C)(1), (C)(2), or (C)(3). The wiring method used to supply signs and outline lighting systems is required to terminate within a sign, an outline lighting system enclosure, a suitable box, or a conduit body. The wiring method should include an equipment grounding conductor as specified in 250.118 for grounding the sign or system and meeting the general requirements of 600.7. This method of grounding should be verified by field inspectors, even on listed signs. Tight mechanical connections, made in a workmanlike manner at fittings terminating in sign enclosures, are important in maintaining an effective ground-fault current path. If the equipment grounding conductor is of the wire-type, the connection of the conductor to the enclosure must be made in accordance with 250.8 using listed pressure connectors, listed clamps, or other listed means. Sheet metal screws are not permitted to be used to connect grounding or bonding conductors or connection devices to enclosures. This is a common problem in the field and verification of the grounding conductor connection should be part of any thorough inspection process. This is an important safety circuit. 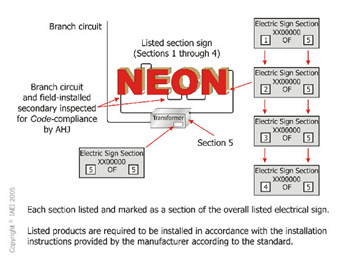 The branch circuit supplying signs, per NEC 90.3, must coomply with the general rules in chapters 1–4 unless they are supplemented or modified in Article 600. An example of requirements that are modified can be found in Section 600.7; 600.32(A)(4) and (A)(5). Signs and transformer enclosures are permitted to be used as pull or junction boxes for conductors supplying other adjacent signs, outline lighting systems, or floodlights that are part of a sign, and shall be permitted to contain both branch and secondary-circuit conductors. It should be emphasized that there are clearance requirements for high-voltage secondary conductors Secondary conductors of field-installed skeleton tubing installations must be separated from each other and from all objects other than insulators or neon tubing by a spacing of not less than 38 mm (1½ in.) as provided in 600.32(E). Where metal or nonmetallic poles are used to support electric signs, the pole is permitted to enclose supply branch-circuit conductors, provided the poles and conductors are installed in accordance with requirements of Section 410.15(B). As indicated in the beginning of this article, only some of the basics of inspections of signs and outline lighting systems are covered here. Essentially the equipment covered within the scope of Article 600, listing and marking requirements, approvals, and the requirements for branch circuits are discussed in this writing. There are many other requirements contained in Article 600 as well as other parts of the NEC that must be applied in the inspection process, such as the required disconnecting means for the special equipment covered in 600.6; grounding requirements as provided in 600.7; locations including wet locations as provided in 600.9; and enclosure requirements as covered in 600.8. Although field-installed skeleton tubing installations are not required to be listed, listed parts and components are available for constructing and installing these systems. Requiring the use of listed parts and components in these installations is helpful in attaining compliance and is a useful tool in the approval process of these installations. Parts I and II of Article 600 apply to these installations. The primary objective of this article is to raise the level of awareness of inspectors and emphasize the importance of electrical inspections of electric signs and outline lighting systems. The enforcement community has an important role in electrical safety; and to be effective, inspections must be made. 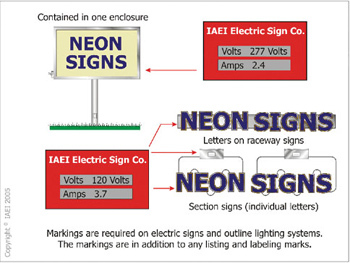 Inspectors have requirements built into the NEC that can be of substantial assistance in attaining code-compliant electric sign and outline lighting systems. With the specific requirement for listing, as indicated in Section 600.3, the approval process becomes much more manageable for the enforcement community. Requiring listed signs and outline lighting systems is step one. The next steps should be to assure compliance with any installation instructions included in the listing and to verify that the equipment is being used within those limits. For any field-installed portions of listed electric signs and outline lighting systems, be sure that all other applicable NEC requirements are met. Know how and when to utilize special permission in the approval process. Typically, special permission is utilized in the approval process on a limited basis. Field-installed skeleton tubing installations are not required to be listed but are required to meet all of the applicable provisions of Parts I and II in Article 600. Also any field-installed wiring methods must be in accordance with the applicable provisions of chapter three, such as supports and securing requirements. The authority having jurisdiction is responsible for interpretations of the Code rules and approvals. It is important to understand that listing is not an approval, but it usually serves as the primary basis for the full approval process. If there is no inspection, there obviously is no approval. Seems like a fairly elementary concept or process to implement, yet there continues to be an enormous amount of noncompliant electric sign and outline lighting displays out there. The requirements of the NEC are the minimum, which basically means one needs to do at least that much. Still it seems like there is so much work to be done in this area. This article is based on the rules contained in the 2005 edition of the National Electrical Code and does not include any local amendments or code requirements. Next articleIs it permitted to replace a sign face on a listed sign?